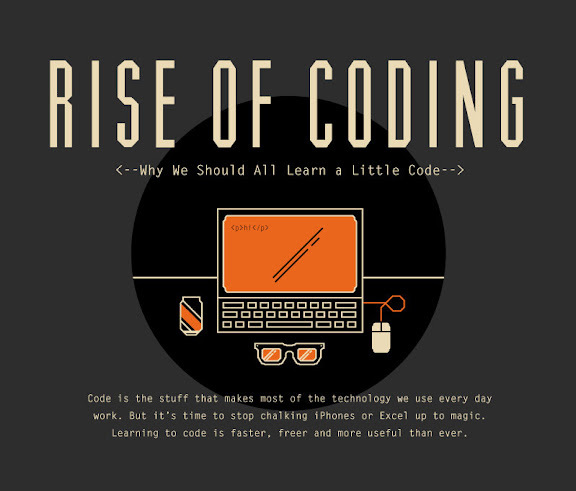 Allison Morris from OnlineCollege.org put together a graphic which takes a closer look at the importance and popularity of coding: http://www.onlinecollege.org/Program-or-Be-Programmed, supporting the case for all of us to learn a little code. This is a great sign for the future of work in the U.S. Coding familiarity is becoming more of an asset across all industries. You don’t need to know how to reprogram your computer to operate it, but understanding how it works will help you imagine how programs can change to better serve your industry. So, if you’re among those of us who’ve always thought programming was impossibly hard or reserved for the tech-minded, consider learning a little code. There’s never been a better (or more supportive) time to get ahead of the curve. You can find the full graphic at OnlineCollege.org, which also offers commercial courses in prgramming.